Q: What is a rabbit's favourite type of music? If you have a pet joke or a funny pet story, click on the Mr Linky below so we can hop right to your blog. Au was so sad when his friend Scoop passed away last September that we were very worried about him. But thanks to Target, Au is now back to his old self. And he's getting tonnes of exercise too! The two cats wrestle several times a day, run like mad things through the house, and play wild games with whatever toy of the moment catches their fancy. Their best fun at present is a piece of string with a Snizzles circle tied to the end. Au tugs one end and "fishes" for Target. Then they run around, each pulling one end in a game of tug-of-war. Au likes this string so much, he took it to his box when he went for his afternoon nap yesterday. It reminds me of watching old Arthur get back a bit of his kittenhood when Rosie moved in. 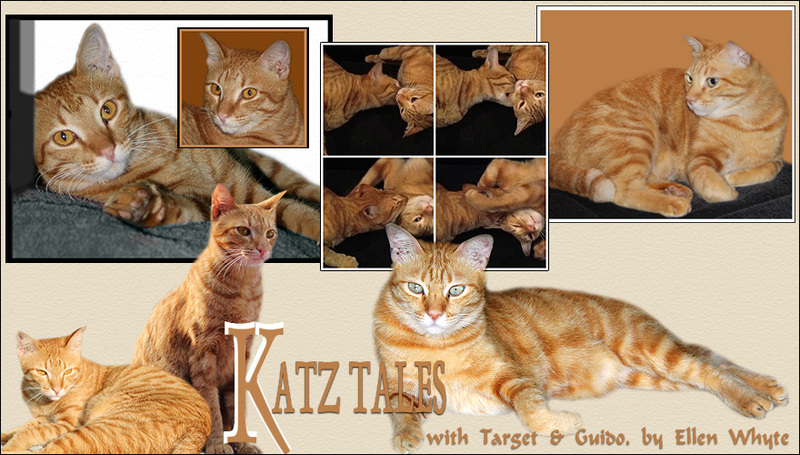 For that tale and more, check out Gattina's blog. See you Thursday for a Pet's Joke? Hey!!!! is this thing working? is this how you do it??? Yes? Cool! Hey, can you see me? Target here! My big pal Au is asleep in his box right now so I get to talk on the blog! Isn't it great?! This is me in my favourite seat. It's driftwood and as you can see it's got a hole that's just purrrfect for me. I fit right inside! Also it's a great way to see the creamy target circles on my side. That's how I got my name! This typing is not easy on the paws. I'm going to check out my mancat in training friends at the Mancat Club. See you next week! Like poodles? Check out the Dog Talk column tomorrow in the Weekend section of the Malaysian national daily, The Star. Print version only! A list of dog tricks, arranged in order of increasing difficulty. There is also the Poodle Web Ring that has lots of interesting sites ranging from pure breeder ads to fan sites. An aeroplane passenger is taken aback when a man and a Labrador take up the two empty seats beside him. He's just had his aftershave and cigarette lighter confiscated "for security reasons" so he's not amused at seeing a big hairy dog in the seat beside him. Seeing his annoyance, the second man explains he and his dog work for the airline's security division. "Sniffer is the best security professional in the field," the man boasts. "He's the best of the best. Just wait and see." When the plane is up in the air and seatbelt signs go off, Sniffer gets up and wanders down the aisle, sniffing at all the passengers. Sniffer stops briefly by the side of a woman, sniffing intently. He then strolls back and puts a left paw on the handler's arm. The handler says, "Good boy!" He makes a note of the woman's seat and whispers confidentially, "Sniffer says she's carrying marijuana. We'll pick her up when we land." The first man is very impressed. He's equally impressed when Sniffer stops by another passenger, returns and puts two paws on the handler's arm. "He's carrying heroine," the handler says making another note. The dog goes off a third time, sniffing at everyone in the plane. Suddenly Sniffer grinds to a halt. He sniffs intently at a passenger and then bolts back to the handler. But instead of putting up one paw or two paws, the dog poops all over the seat and buried his head in the handler's lap. "What the hell is going on?" asks the passenger in surprise and disgust. "I thought you said this dog was the best of the best?!" "He is," the handler replies shakily. "He just found a bomb!" "Oh Oh! Death AND the hanging man???!" I've brought out the tarot cards again after more than a year of leaving them in the box. But as you can see, Au was horrified at the results. But it's OK. We checked the book and it turns out that the hanged man stands for sacrifice, death as the end of something, justice for... well justice, and the queen of pentacles is for abundance. So we're figuring that now that Target is growing up a little, the time where Au automatically sacrificed everything to his small friend is over, and justice being done to our senior kitty, the time of abundance is here again! I was quite proud of remembering what the cards meant so fast and it wasn't till later that I realised I'd forgotten to shuffle the dratted pack and we got the same cards as last time. Now does that still mean this is valid or what???? We're confused! If you're taking part in Cats On Tuesday, please click on the Linky so we can hop straight to your site! And pop in day after tomorrow for more Pet Jokes. This little chit-chat raced across the floor, scooted over Au and Target's little blue and cream rug, and shot up the wall, well out of the way of Target's sharp little claws. But as you can see, our little lizard picked up some debris on the way. Our friend is about 4 cm long, and that thread from the rug hanging from his tail is as big as he is. Weird sight, huh? If you're taking part in Wordless Wednesday or rather Wordless Monday, please click onteh Mr Linky so we can hop directly to your site. Here's Au, lying peacefully in the middle of the bed. As you can see by the evil glint in his eye, he knows I want to straighten the whole lot out, and is determined to stay put. Of course I am but a slave to his fuzzy paw so he gets his own way as usual. Au's fine sense of power is the subject of the Katz Tales column that comes out in the Weekend section of the Malaysian national daily The Star tomorrow - print version only so you have to buy it! There's also a discussion about cat and dog rights. Meem Siah Li Ming, a marketing and operations manager at an animal medical centre in Kuala Lumpur who lives with cat and dog friends Arwin aged 5 and Jackie aged 3, suggests responsible pet owners work to make these conditions a must for all our fuzzy companions. Ideas? Opinions? Suggestions? Links? Feel free to post! How do cat's keep law & order? If you have a pet joke, add yourself to the linky below - it means we can hop straight to your site instead of going via the biopage. You can get your own Mr Linky here. Au is getting too fat around the middle. Our friend sent him some imported cat food with wrapping that announces in a dozen languages how wonderful, healthy etc the biscuits are. They're supposed to be part of a calorie controlled diet. And what does Au say, "I'm not eating this! Mancats Don't Diet!" In the end we gave them to the outside stray cats who live in the storm drain. Looks like Au is going to keep those love-handles and furry tiger tummy a while longer. Here's Mona, the mixed Spitz who lives a few roads down from us. She doesn't look it but Mona is 12 years old. She the feature dog in Dog Talk, the column published in the Malaysian national daily The Star, Weekend section tomorrow. Thinking of adopting a mixed Spitz? Duke aged 2 is waiting for adoption at the Selangor SPCA shelter. He’s very friendly, well-behaved, highly intelligent and deserves a loving home. Call 03-42565312 / 03-42535179 and make an appointment to meet with him. "Now what's this thing she's always pointing at me?" No need to leave a comment. If you're taking part in Wordless Wednesday, just fill out your name and URL and click Enter - it means others can jump straight to your blog, rather than your blogger profile. This is one of the stray girls who lives in the lane at the back of the house. She looks all sweet and innocent but don't let this fool you! Yesterday she meowed at the window to tell me she was hungry. But when I opened the back door, there was a small pile of food there. She'd played the same trick on my husband five minutes earlier! Au here. I thought that seeing she's gone out, I'd sneak in and have a word. After all, it is Mancat Monday, not Human Monday, right? I need some advice. As she's told you, we've got this mancat in training running around. I quite like the little sprog. For one thing he's got that kitten cute thing going for him. (You see him on the roof in the last post? Isn't he a little poser???) I didn't appreciate his looks at first but now I've trained him to use it for begging extra treats that's coming in handy for both of us! But he will pounce on me all the time. When I'm awake it's great to wrestle. But can't a senior cat sleep undisturbed in his own box? Or on his own bed? Or his personal part of the sofa? Not in this house he can't! I've tried to hold him down and bite him but it only makes him purr. So I want some advice: how do you mancats out there deal with overactive little tails? By the way, this is me on the bed in my favourite pose. It's pretty rare to see me like this nowadays - usually I'm wearing that infernal kitten! Help me, please! Target reaches the pinnacle of our roof and puts on the proper lantern-jawed look of the classic hero. This is one of our favourite pics as it makes us smile no matter what. More of our intrepid kitten's adventures will lappear in the Malaysian national daily The Star, Weekend section tomorrow - print version only! Target is so cute when he begs, that we can't say no. He knows he's irresistible and takes full advantage - especially at meal times. But luckily he has a very good nature so he's not spoiled.